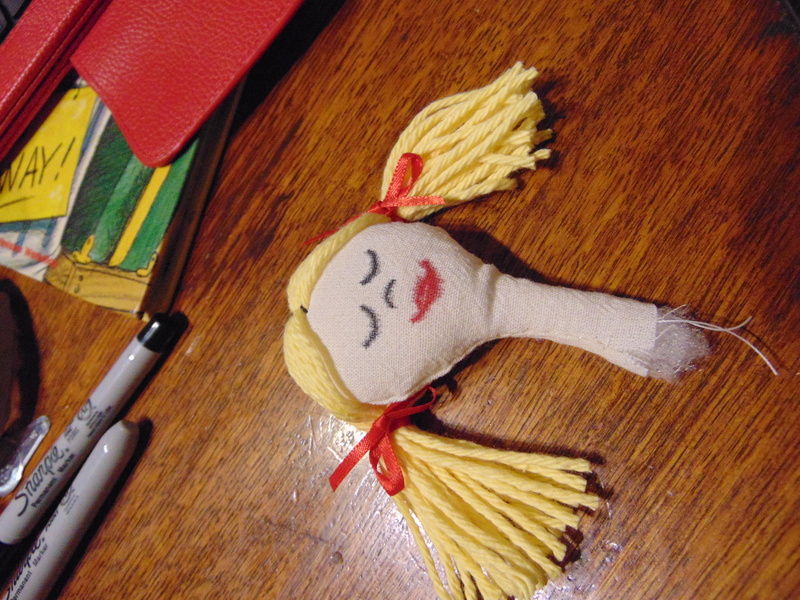 Being creative is hard work! This year I have entered into retirement from my primary employment and moved to being somewhat self-employed. I tat to help keep myself sane. It gives me a break from having to solve all the problems of my other creative self. . . or does it? 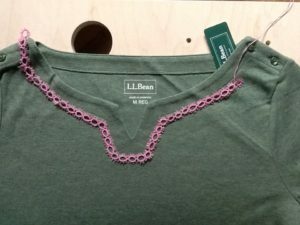 In March of 2017, I undertook to make an edging for a blouse I had purchased and I promised myself I would not wear it until it was finished. 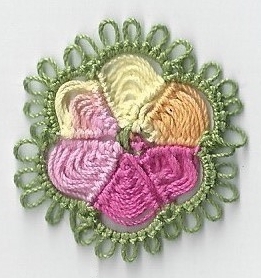 I never intended to make the edging in pink. Pink is far from a favorite color of mine, but it did show up well against the lovely green and I hoped it would help me see where I was wanting to go with the edging. 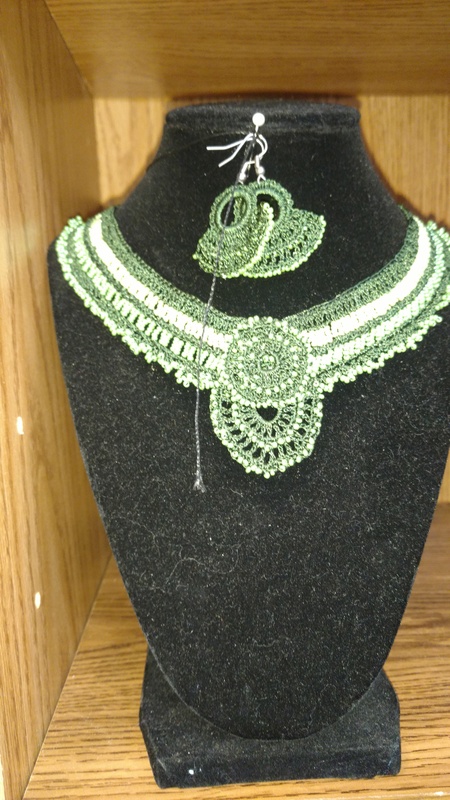 Having made it that far, I changed to the color of thread I really wanted (Lizbeth thread “Herbal Garden” is one of my favorites and I really wanted to use size 40) . 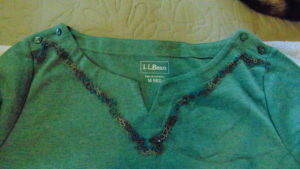 I tried with beads, without beads, with 2 passes, with a special point at the base. The trials seemed endless. I was getting weary of all the modifications, all the trials, all the stresses of just trying to complete the task at hand. Then one day it all fell together. Maybe it had just simmered in my brain long enough. The finished project looks like this: Well, it looked like this when the edging was pinned down and before the final stitching took place. I cannot say enough how much I admire those of you who can sit down and just crank out a pattern or a motif or an earring. It takes tremendous talent, patience and vision to do that. Make no mistake, this one was worn to our regular Friday evening meeting, but is now set aside for Tat Days 2018! And as for the rest of this year: No new projects until the current ones are complete! That was my New Year’s Resolution and I’m determined to stick to it! 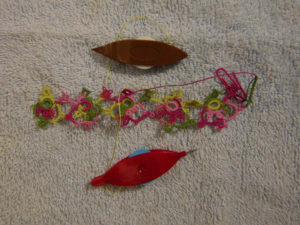 When I first learned to tat, about the only shuttles available were the metal bobbin-types made by Susan Bates or Boye. That was my first shuttle and when you don’t know any better, you run with what you have on hand. 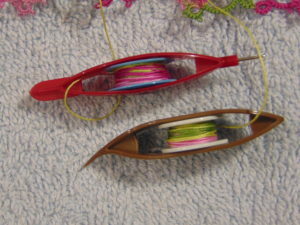 Then in 2006, my daughter-in-law’s grandmother gave me 2 “modern” tatting shuttles: a Pony and an Aero – one of the old English Aero’s at that. They were some of favorites. 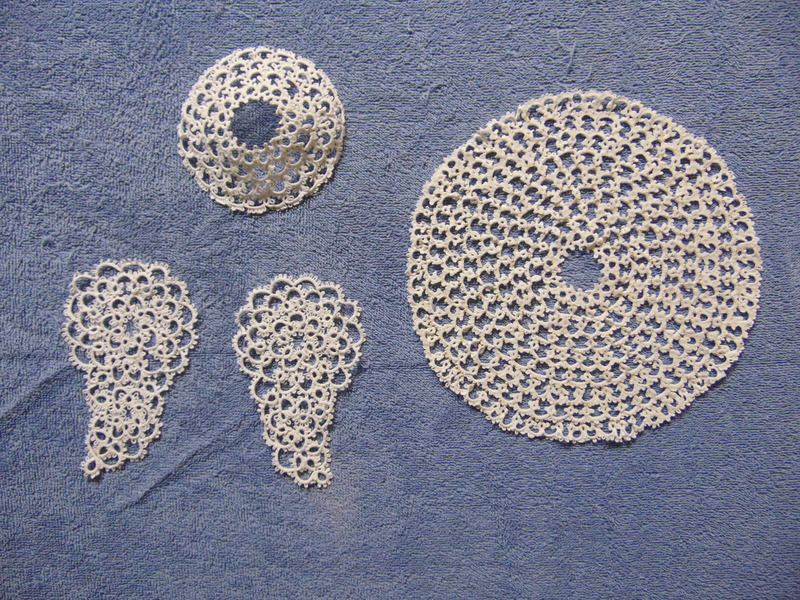 As the years have gone one, I have tried all manner of shuttles, threads and other accessories to the tatting world. I totally enjoy the way fine wood shuttles feel in my hand, but they are not my “go-to” shuttles for everyday lace-making. 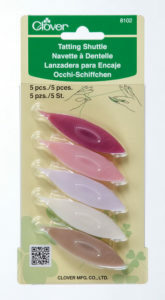 For a long time the Airlits, Starlits, and Clover medium and large shuttles have been among my favorites. Last year at a conference I saw Clover’s new shuttles with bobbins and decided to try one. 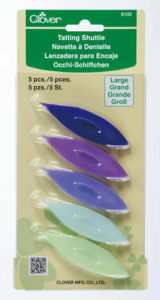 They come in a package with a shuttle, 2 bobbins and winder that doubles as a bobbin stop or makes a bobbin like a ball thread. In the event that a tatter has only one shuttle and may need to change out the bobbins from time to time, the second bobbin can be exchanged with the first and the external shuttle housing can accommodate several bobbins wound with thread. Leave it to the Japanese to be innovative! Yes these are Japanese shuttles. 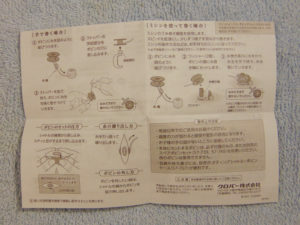 They come complete with instruct ions that need no English translat ion because the diagrams remind me of Japanese Anime, they are that complete. 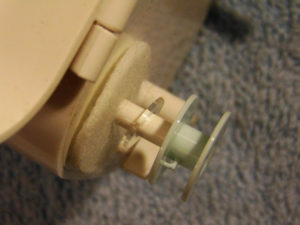 The Clover bobbin shuttle is about the same size as the Airlit and the bobbins hold about the same amount of thread. So having wound both CTM, I proceed ed to tat a bit of edging for the Palmetto Tatters Guild’s next benefit quilt to be auctioned off at Tat Days: The feel of the clover has a substantial feel to it and while it lacks the crochet hook tip, we all keep a small hook on hand and much of the time the clover tip will work for drawing threads through picots. 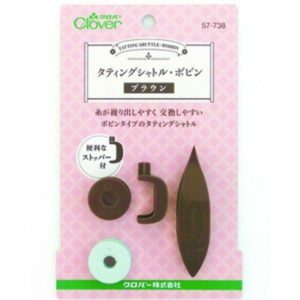 The accessory kit comes with additional bobbins and the primary kit comes with an additional pair of nylon rings that assist in the winding of bobbins in the event that the user chooses to use a winder to add thread to the bobbins. Overall, I’m very impressed with this new shuttle system. In addition to the accessory kit, a case is available to hold bobbins and shuttle housings. Each user will make up their own minds, but I’m happy with this shuttle system. The 2017 Deck the Trees event at the Monte Vista was a true success! This image documents the amount raised by donations, “votes” and matching funds for the Swannanoa Valley Christian Ministries’ food and fuel assistance program for needy valley residents during what appears to be a very cold winter. Thanks to everyone who came to the Monte Vista this year, who gave of themselves and their talents, time and money for others. I am told by volunteers to food bank programs in our area that the final total was more than $ 25,000 from this effort. It’s time for the Monte Vista Hotel’s annual Deck the Trees event to benefit the Swannanoa Valley Christian Ministries’ winter supplement programs. Thanks to all the contributions from Thread Bears Sherry, Anne, Shonn, Jill, Jo, Tammy, Leigh and Fran, this years tree is 6 feet tall. 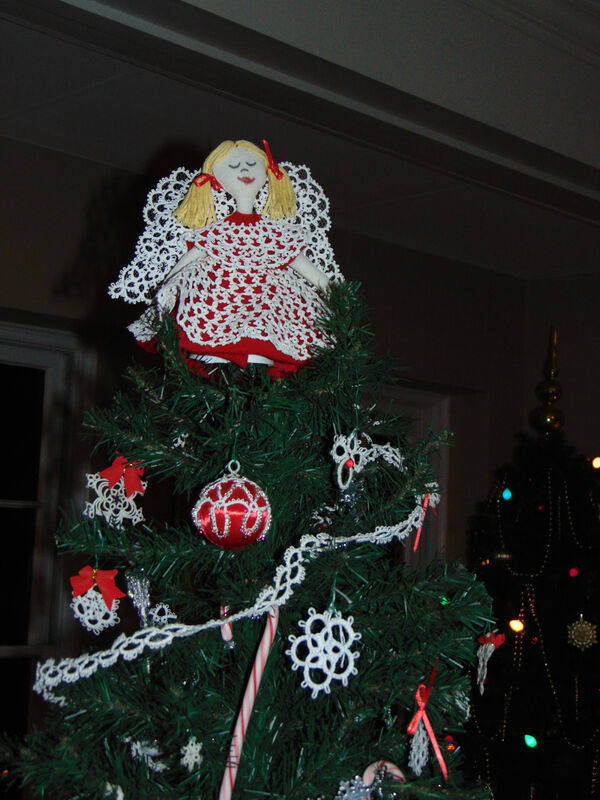 This year, our tree is in the Dining Room – a more prominent place that usual. At first there was general disappointment that the tree chosen didn’t have lights on it. When we considered that this year’s theme was “80 years of Christmas” in honor of the Monte Vista’s 80th anniversary, we realized that in 1937, much of Black Mountain was without electricity anyway. So an old fashioned tree with traditional ornaments and garlands would be consistent with the lack of lights. We decided to accept the idea. 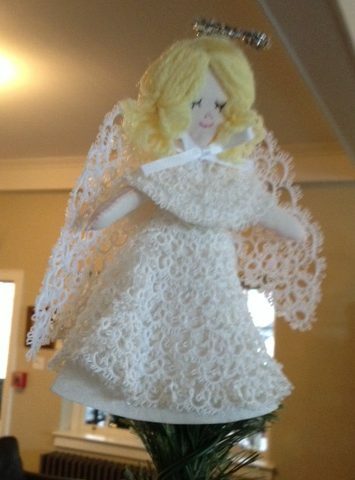 Back in 2014, we were honored to be able to use Sherry’s mother’s tree-top angel. It was such a lovely addition to the tree, that a replacement was in order. The process was begun in January of this year as was finished over the Thanksgiving holiday. 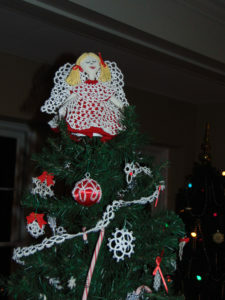 While the all white example seen here is lovely, I thought adding a bit more color would be a welcome addition to the tree. 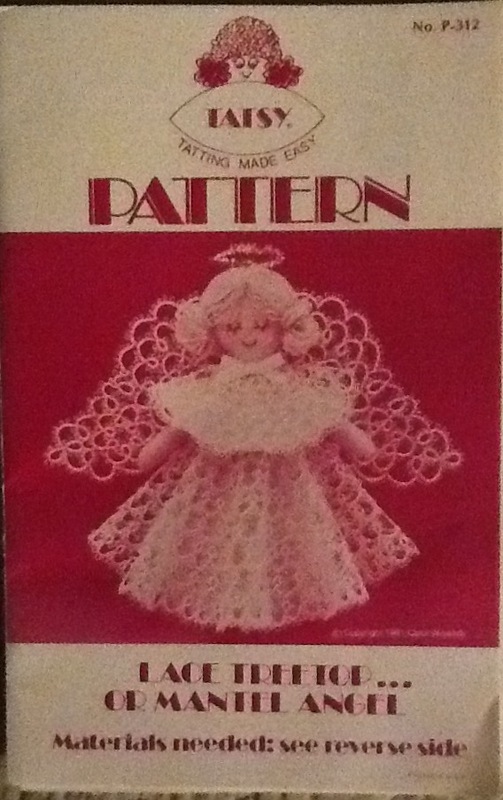 I had found the pattern written by Tatsy in about 1983 or 1984, so that made the project a bit easier. 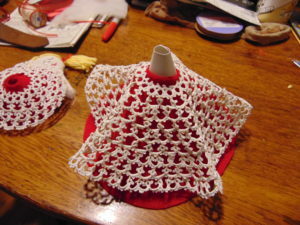 It had taken from January to October to complete th e 4 tatted pieces that make up the angel itself, the largest of which is the skirt and is about 9 inches or so in diameter. One additional touch was to add small gold beads to each of the joins between the rounds on the skirt. Hopefully this would make it stand out a bit. 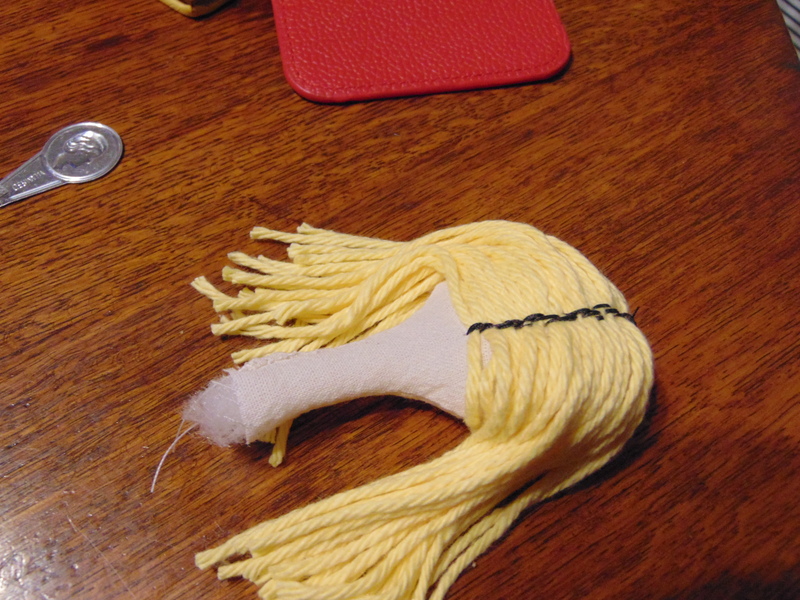 It also slowed the process down somewhat, so the skirt is the only piece that received this treatment. Once all the tatted pieces were finished and stiffened, I needed to select the color of felt for th e under skirt and yoke. In the end, red was the only real choice partly because felt comes in such a narrow range of colors and primary colors rule the day. 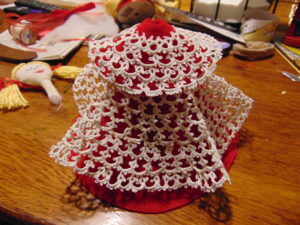 First the skirt was cut out and centered over the cardstock cone that would support the entire structure. Then the tatted was placed on top of that. 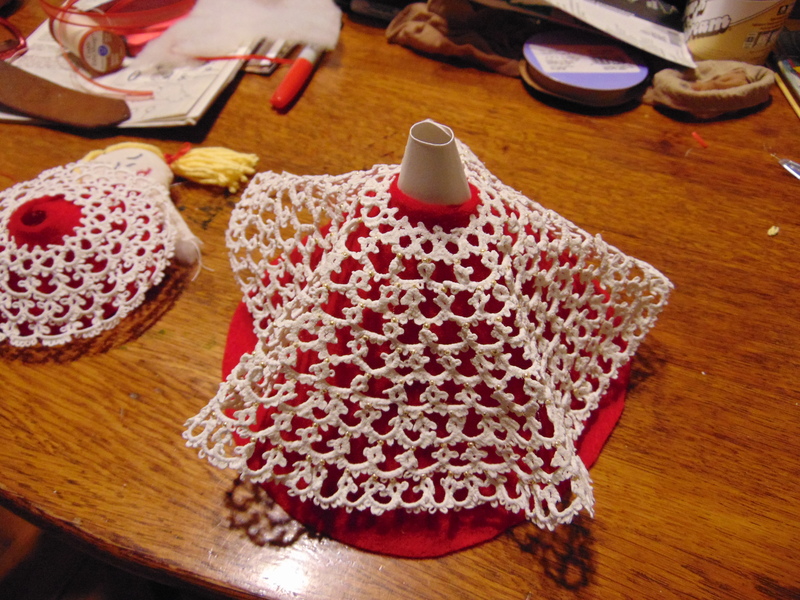 Then the yoke was cut according to the pattern and the tatted yoke overlay was placed over it. Next came the head and arms. They could be made from unbleached muslin rather than the pink felt that was suggested by the pattern. 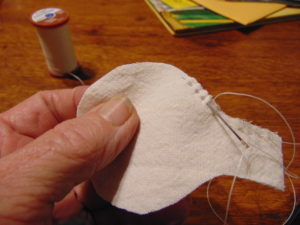 The muslin would be a bit easier to shape and reverse for stuffing once the 2 pieces had been stitched together. Then there was adding the hair and bows before bringing all the “angel features together . 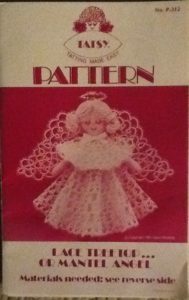 This particular pattern is easy to follow and does have all the pattern pieces in the proper scale included. Taking the time to copy the templates for the face, arms and outfit components does preserve the pattern for future use as well. So this year’s Decked Tree isn’t quite as bright, but it is sill covered with the things that made Christmas so special 80 years ago: tinsel, white cotton ornaments, candy canes and love. 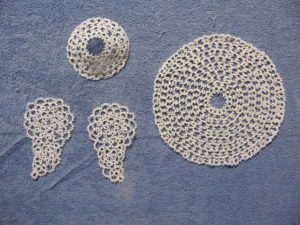 It isn’t often that we as a group of tatters and lacemakers are invited to demonstrate our skills. So I was pleased to receive an invitation from Kimberly Floyd of the Zebulon B. Vance Birthplace outside of Weaverville, NC late last spring. 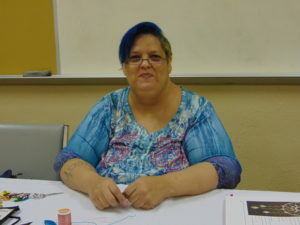 She had heard about The Thread Bears and invited us to attend their annual Appalachian Folk Festival. I agreed to come to the event, totally unsure if any other Thread Bear members might be able to attend. The Birthplace is one of the sites affiliated with the NC Department of Natural and Cultural Resources as a state historic site. Zebulon Vance was the governor of NC during the Civil War beginning with his inauguration to a 2-year term in 1862. There is the house, a visitor’s center and at least one out building in which the Vance family lived and worked after obtaining the property around 1815. It is a rather remote location today, and it is clear that when the only way to reach the farm was by wagon, on horseback or on foot, it was a remote location, indeed. I don’t know if the family had any members who tatted. The spinning of flax and wool were certainly part of daily life there. There was one person present at the Festival who was demonstrating spinning using a drop spindle. While spinning wheels were widespread throughout Europe in the early 1800’s, there were not so common at that time in these mountains. In the bedroom of the main house was what appeared to be a Christening gown which was lined and was decorated with embroidery of the day. The threads were quite a bit more coarse than threads we find today. There were 3 of us who were present and demonstrating tatting. Our “booth” was near the front door to the Visitor’s Center and we were directly in front of a large display describing Governor Vance’s career as a lawyer in Asheville, NC. 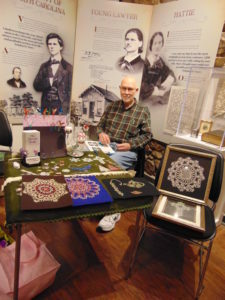 Here you can see Shonn along with examples of tatted doilies, bookmarks and other adornments for clothing and accessories. 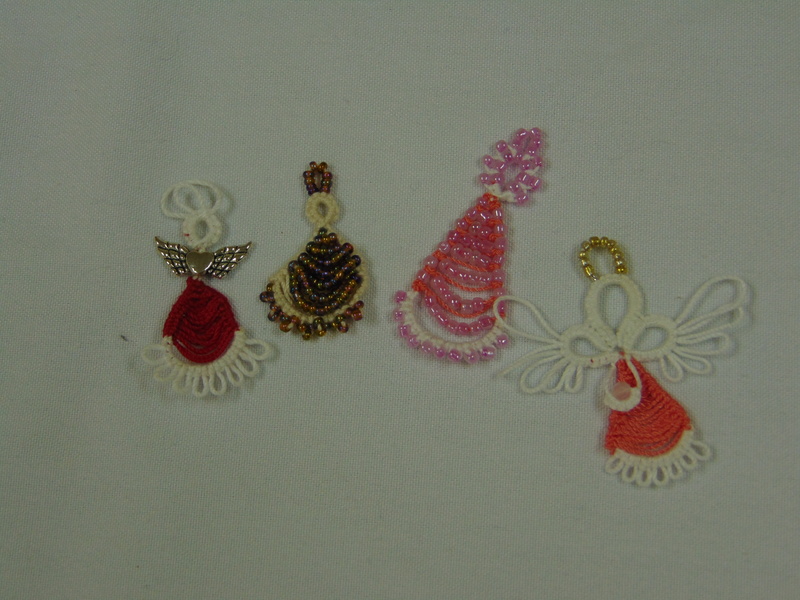 We also had prepared some simple book-marks of large paperclips, ribbons and a small piece of tatting for our visitors. There were about 180 visitors to the center that day, in spite of the cool rainy weather. 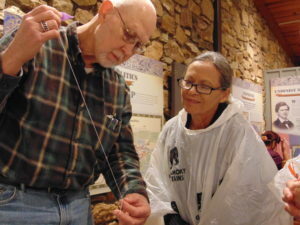 The person from the NC Department of Natural and Cultural resources told us that in his 12 years of taping events such as this one around NC, he had never actually tapped anyone making lace. We were amazed and at the same time honored to have made that distinction. We will be watching for the video of the event in the weeks to come. The most wonderful thing about Tat Days is the networking! For the past 7 years, I have had the privilege of meeting tatters from all over the United States, Canada and the UK. Many of whom are marvelous persons, experienced at the art and craft of tatting and who have influenced so many of us as we have grown in this lace form. Wally Sosa was present this year direct from the eastern part of North Carolina. What a delightful teacher she is!! 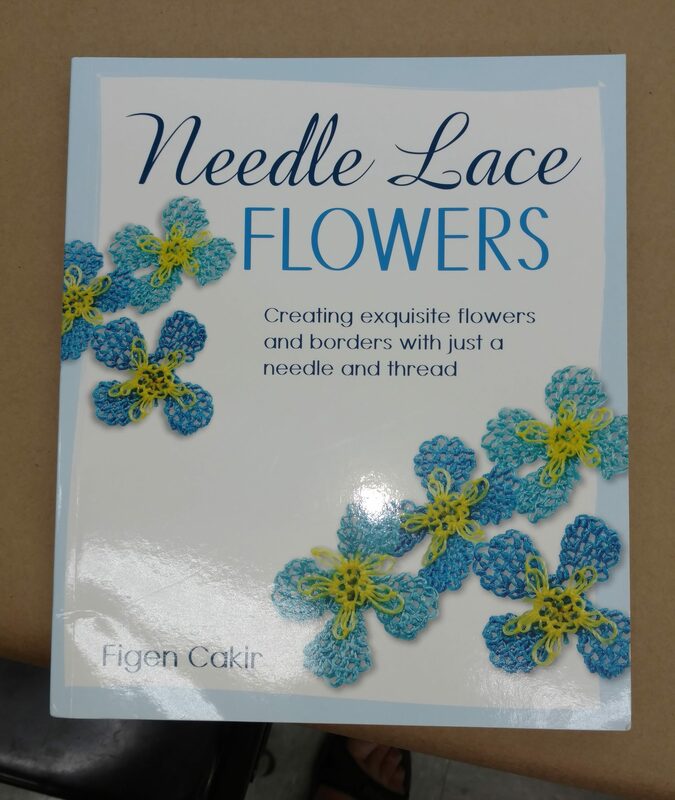 Other reference sources include the book “Needle Lace Flowers” by Figen Caldr which has a number of beautiful 3-dimensional patterns inside and is shown below. There are also several videos of this technique on YouTube. I always enjoy myself and the company of other tatters when I go down to Tat Days – or any of the other conventions I have attended through the years. 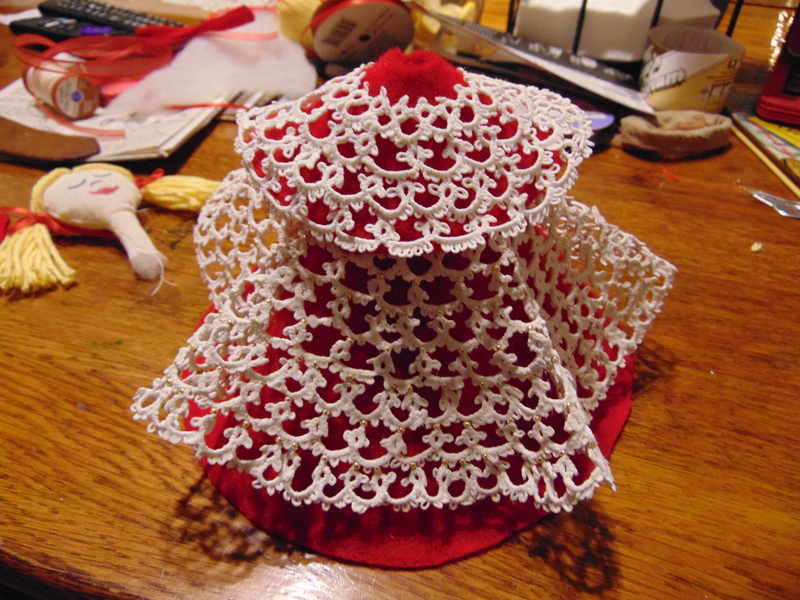 Hat’s off to Tatting!! !